Yes..I know its not an inverted center stamp, but it is the most expensive and most famous stamp. 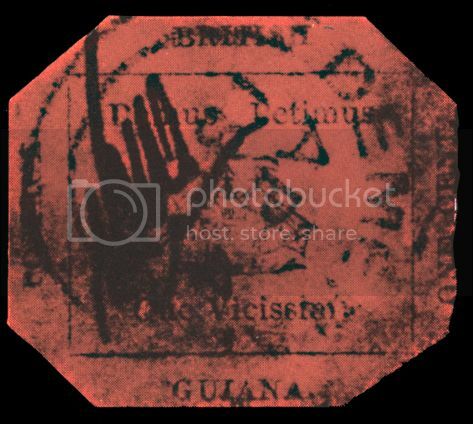 The British Guiana 1c magenta is regarded by many philatelists as the world's most famous stamp. It was issued in limited numbers in British Guiana (now Guyana) in 1856, and only one specimen is now known to exist. It is imperforate, printed in black on magenta paper, and it features a sailing ship along with the colony's Latin motto "Damus Petimus Que Vicissim" (We give and expect in return) in the middle. Four thin lines frame the ship. The stamp's country of issue and value in small black upper case lettering in turn surround the frame. The 1c magenta was part of a series of three definitive stamps issued in 1856 and was intended for use on local newspapers. The other two stamps, a 4c magenta and 4c blue, were intended for letter postage. The issue came about through mischance. An anticipated delivery of stamps by ship did not arrive so the local postmaster, E.T.E. Dalton, authorised printers Joseph Baum and William Dallas, who were the publishers of the Official Gazette newspaper in Georgetown, to print an emergency issue of three stamps. Dalton gave some specifications about the design, but the printer chose to add a ship image of their own design to stamps. Dalton was not pleased with the end result, and as a safeguard against forgery ordered that all correspondence bearing the stamps be autographed by a post office clerk. This particular stamp was initialled E.D.W. by the clerk E.D. Wight. Only one copy of the 1c stamp is known to exist. It is in used condition and has been cut in an octagonal shape. A signature, in accordance with Dalton's policy, can be seen on the left hand side. Although dirty and heavily postmarked on the upper left hand side, it nonetheless could be the most valuable stamp in existence. It was discovered in 1873 by a 12-year-old Scottish schoolboy, L. Vernon Vaughan, in the Guyanese town of Demerara (whose postmark the stamp bears), amongst his uncle's letters. There was no record of it in his stamp catalogue, so he sold it some weeks later for six shillings to a local collector, N.R. McKinnon. In 1878 McKinnon's collection was sold to a Liverpool stamp dealer, Thomas Ridpath, for £120. Shortly afterwards, the same year, Thomas Ridpath sold the 1c to Philipp von Ferrary for about £150. His massive stamp collection was willed to a Berlin museum. Following Ferrary's death in 1917, the entire collection was taken by France as war reparations following the end of World War I.